Our journey together began in 1971 in Tallahassee FL, and continued from there to Mexico City, Washington DC, and, most recently, Austin TX, where we both worked in the communications arena. Now in Buenos Aires, we are writing and posting at the urging of friends interested in what we are doing in our new home town and why. Beautiful Buenos Aires apartment . . . has been sold. Yesterday Argentina observed Día de la Memoria por la Verdad y la Justicia (Day of Remembrance for Truth and Justice). The holiday commemorates the victims of the military dictatorship, which seized power on March 24, 1976. Tens of thousands of Argentines as well as citizens of other countries (notably Chile and Uruguay) were taken from their homes, schools, or places of business, illegally detained and tortured because of their alleged political beliefs. Some 30,000 people were killed or "disappeared," i.e., their bodies have never been found. 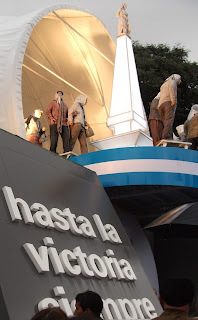 After the military junta was overthrown and free elections held in 1983, those who participated in these crimes against humanity were awarded an amnesty in the "interests" of national reconciliation. However, in 2006 (the year the Day of Remembrance became a national holiday), that amnesty was overturned, and many of those who ordered and/or took part in the illegal detentions, tortures, and murders were arrested and charged with the crimes. The trials are still continuing. Considerable credit for the investigations into and prosecutions of what is now known as the "Dirty War" goes to the "Madres de la Plaza" who still march every Thursday in front of the government building in Buenos Aires calling for action on their disappeared sons and daughters. Not all Argentines agree with the trials. Some say the military dictatorship was forced to take such extreme measures because of "subversive" groups that were "terrorizing" the country. Kurt has been following several of the more famous trials; as he notes in his reports, the Argentine government had all the legal tools at its disposal to arrest, charge, prosecute, and incarcerate domestic terrorists. But the junta chose to operate outside the rule of law, turning the country into a rogue state. We do well to remember these dark moments of history.